Things got testy between Florida and Vanderbilt. 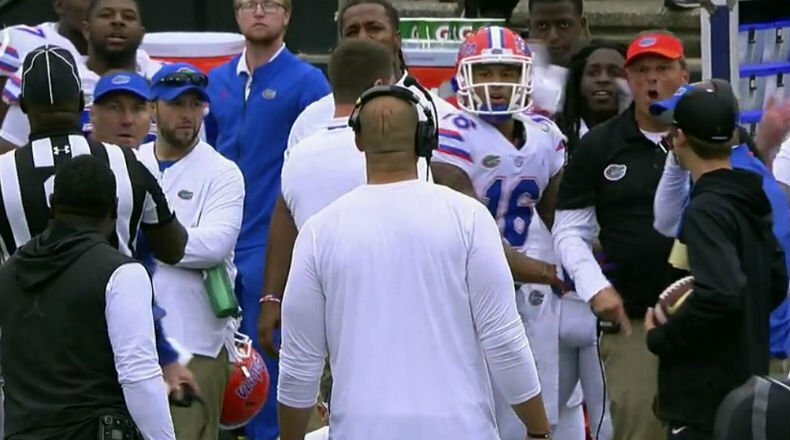 Following a vicious Florida hit that resulted in a targeting penalty, Gators’ head coach Dan Mullen got into a shouting match with Vanderbilt head coach Derek Mason. Trailing at the time, Florida defensive coordinator Todd Grantham shared some words with Mason. Something said during the altercation enraged Mullen. The two sides did the “hold me back” move before it escalated even further. Both benches cleared and unsportsmanlike conduct penalties were thrown on each side, forcing Florida’s Vosean Joseph out of the game. It will be interesting to see if Greg Sankey or Steve Shaw hand down any other punishment following the game. Vanderbilt travels to Lexington next Saturday night to take on the Kentucky Wildcats. Tenn up on Auburn, Vandy up on Fla??? I can hear Rod Sirling announcing th UK-UT game this year. Where was the fight at? I didn’t see it on any of the replays , maybe it was too graphic & violent for a replay ? fight is the real deal fellaz. I’ve been saying for decades that Vandy has some of the worst puncks in the SEC. I don’t know if it’s the chip on the ‘smart’ schools shoulder or what. Ask any former UK player and they’ll tell you the same. Their football fans are the same. BTW the FL player not even on the field getting tossed was ridiculous. Sure he had a penalty already but getting tossed on a TEAM penalty is just stupid!